The boys have announced that their brand new single Rise & Fall that was masterminded by Daniel Omelio aka RoboPop alongside Emily Laura Katter, Sam Nicolosi and DNA Songs, and is a powerful mid-tempo pop track complemented by its poetically meaningful lyrics. 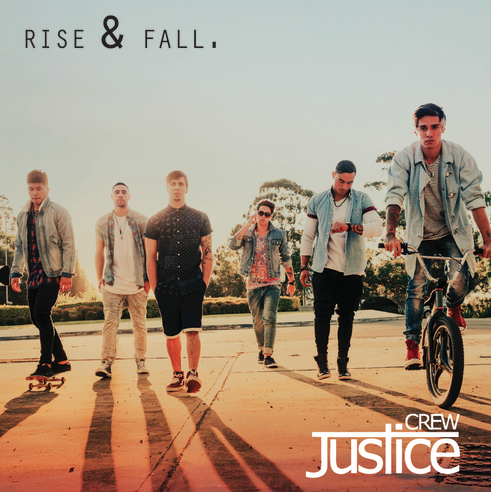 The perfect follow up to their record breaking hit Que Sera, ‘Rise & Fall’ further illuminates that Justice Crew are heading in a new and exciting direction. As Justice Crew member John Pearce explains, "We have had our pop music and our club bangers, but we edged off to the side with ‘Que Sera’– and now with ‘Rise & Fall’ we are exploring a whole new side to Justice Crew. It's got a sort of 'love' meaning behind it… it is a romantic song, but the lyrics are really metaphorical." Rise & Fall is another taste of what is ahead for Justice Crew's long-anticipated debut album, set for release later his year – which, as Solo explains, "rises and falls with slo' jams and dance numbers.” Meanwhile, these social media favourites are generating heat globally with Que Sera. The sextet recently returned from a US promo jaunt and as John himself says with typical understatement, "The hype is slowly building!" Grab a listen of the track below and grab your copy on iTunes now..!